Into the Woods is a musical with an original story about a baker and his wife who want to start a family and their interaction with a witch that has placed a curse on them. This original story is tied beautifully to the plots from several Brothers Grimm fairy tales. The main characters are from “Little Red Riding Hood“, “Jack and the Beanstalk“, “Rapunzel“, and “Cinderella, and a few others. The baker and his wife interact with these storybook characters on their journey. Damian once sang “Agony” — the musical number he sang as Cinderella’s prince in Into the Woods — on Popcorn with Peter Travers. In this particular scene, Cinderella’s prince and Rapunzel’s prince, who are brothers, compare the misery that their new found and unobtainable loves give them. 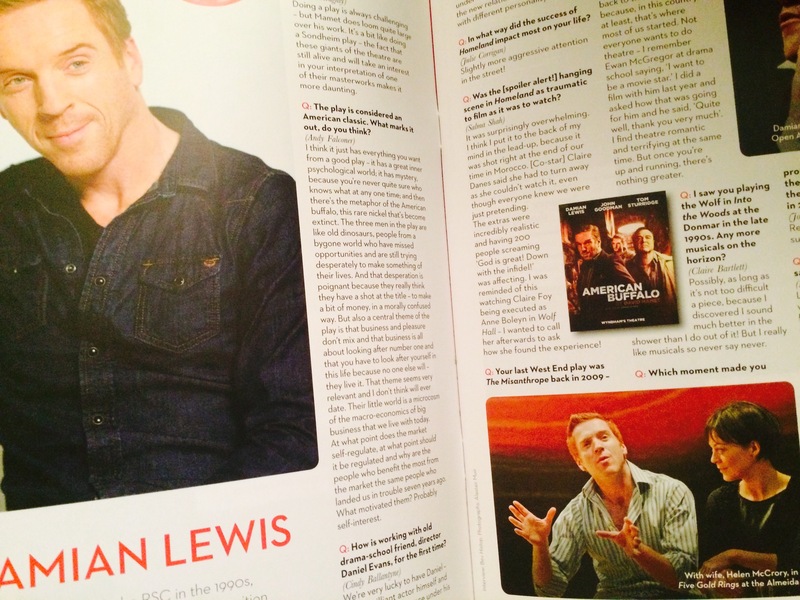 I told you earlier about American Buffalo programme booklet having fun questions asked by fans and answered by Damian Lewis! Here is a fan question from that booklet! 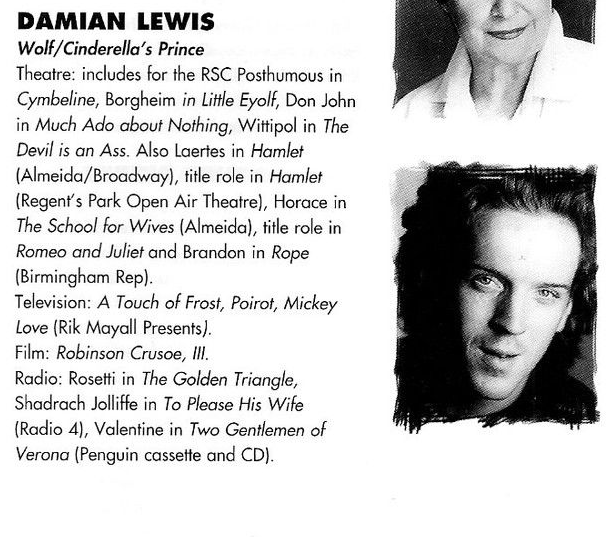 In fact, there were rumors in early 2013 that Damian was in some kind of early negotiations to play the lead character in a West End revival of the musical Me and My Girl, set in 1930s and telling the story of Bill Snibson, an “unapologetically unrefined cockney gentleman named Bill who learns that he is the 14th heir to the Earl of Hareford.” It may be that Damian’s schedule in 2013, including Homeland Season 3 shoot, did not let him go ahead with the musical, or it could be something else, but the production did not go through in the end, either. 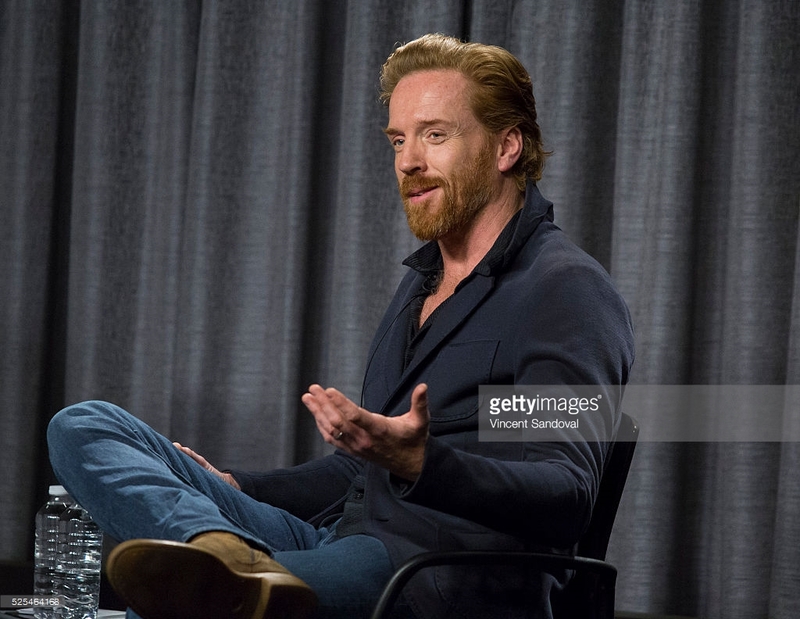 And, guess what, he leans on a wall holding a copy of The Evening Standard and sings “Leaning on a Lamppost” from Me and My Girl as his opening number when he hosts Evening Standard Theatre Awards at the Savoy Hotel in London, in November 2013. Notice Damian’s Movember Moustache! 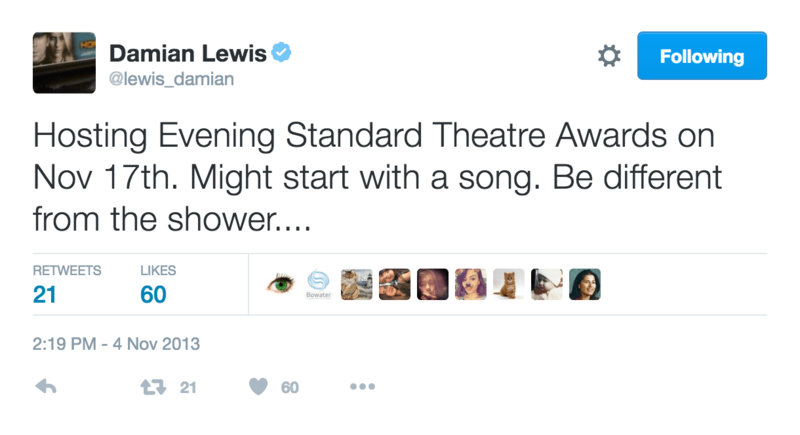 His tweet about his preparation a few weeks before the awards ceremony is priceless! Please copy and paste the link below and… ENJOY! Let’s have one more song in closing because why not? Damian sang a lovely standard, You Brought a New Kind of Love to me on his most recent appearance on Popcorn with Peter Travers. Even though Frank Sinatra version of this love song is the most famous, we would take Damian’s version over it anytime, wouldn’t we? Renaissance man he is! 🙂 Thank you for reading! Damianista, you and I have had the conversation so many times that we would love for him to play Henry Higgins on Broadway in “My Fair Lady”. 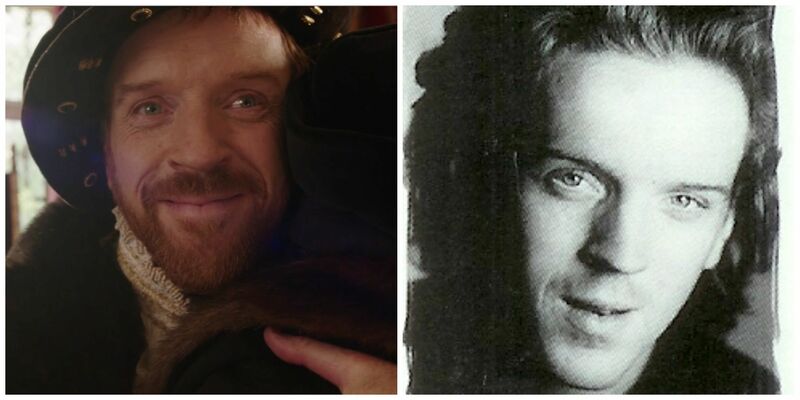 That would be a great musical for him! !